Advice for exporters: should I use a freight forwarder? Mark Woolnough is a freight expert with nearly 20 years’ experience and the founder of Freight Filter Ltd. Here, Mark explains the role of a freight forwarder and how one can help you with your transporting your overseas orders. An easy way to explain the role of a freight forwarder is to imagine them as a “travel agent of international trading” – a much more pleasing analogy (at least to me!) compared to the FIATA shorthand description, which is “the architect of transport”. Whichever version you prefer, a freight forwarder helps companies move their shipments from A to B in the most cost effective method, smoothing the passage through the myriad of processes and regulations required by different countries. Freight forwarders contract with respective carriers – that is, airlines, shipping lines or hauliers – to transport the goods. Usually a forwarder does not physically move the shipment but acts as an expert in the logistics process. Some freight forwarders have their own vehicles and warehouses, but the predominant model is a non-asset based freight forwarder who try to select the best supplier for each leg of the shipment. 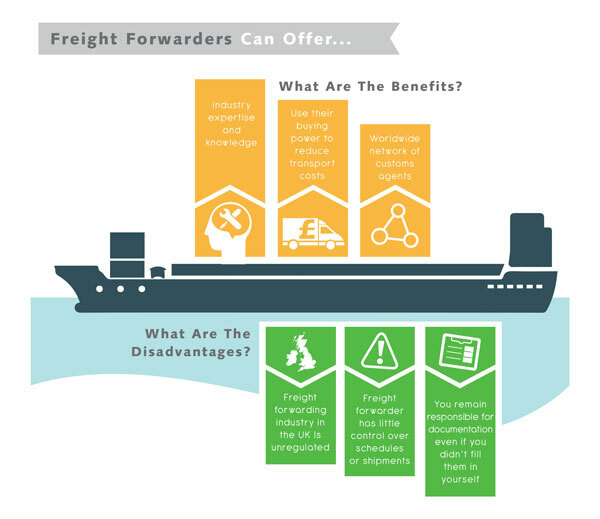 When should I use a freight forwarder? In the main, anyone involved in shipping internationally would be best served by working with a good freight forwarder. Even the large Beneficial Cargo Owners (BCOs) such as Tesco and Marks and Spencer, still work with freight forwarders for parts of their business because of the knowledge and flexibility freight forwarders can add to their supply chain network. A freight forwarder can become an extension of your business in many ways. They can be your outsourced shipping department, adding valuable knowledge and advice to the process of importing and exporting, saving you both time and money. Check out Open to Export’s article on the different delivery options available for more information. What could I expect one to do for me? Typically, a freight forwarder should be able to understand your requirements and identify the best transport option to move the shipment in the required timeframe and at a competitive price. Logistics and supply-chain management, which has many facets but can consist of fulfilment, customs consultancy, contract logistics services, plus other similar value added services. What are the benefits? Are there any disadvantages? Provide confidence to export to or import from new markets. The freight forwarder will have little control over schedules or shipments as they are contracting third parties. How do I find a good freight forwarder? Despite the industry being slow to embrace technology, the internet is becoming a good place to research freight forwarders. The best place to start would be the British International Freight Association (BIFA) who have around 1500 freight forwarders as registered members trading under their terms and conditions. This article on finding the best freight forwarder using comparison websites gives more advice.